AKCP distributor, MESOFT Business Solutions formally Al Jallaf Computers L.L.C worked together with the Canadian University of Dubai to install a security and environmental monitoring system for their data center and audio visual infrastructure. The Canadian University of Dubai was founded in 2006 and is located in the heart of Dubai’s downtown district. Their academic programs are based on the Canadian curriculum and offer a wide variety of courses including engineering, applied sciences and technology. CUD’s facilities in Dubai lacked adequate security to monitor smoke and door open events. CUD wanted to monitor their environmental and power infrastructure within their server and audio visual infrastructure room. Using AKCP equipment, Al Jallaf Computers L.L.C designed a complete system solution for CUD, solving their security, power and environmental monitoring issues. CUD’s four rack installation included AKCP Temperature and Humidity Sensors to monitor the climate of each server cabinet. Mains voltage was monitored using an AKCP Power Monitoring Sensor. Water Leaks were monitored using AKCP Rope Water Sensors. The Water Sensors were installed in the raised floor under CUD’s UPS systems. An AKCP Security Sensor was installed on the main entrance door to monitor door entry events. An AKCP Smoke Sensor provided 24/7 monitoring of smoke / fire conditions. The installation was monitored using the AKCess Pro Server. 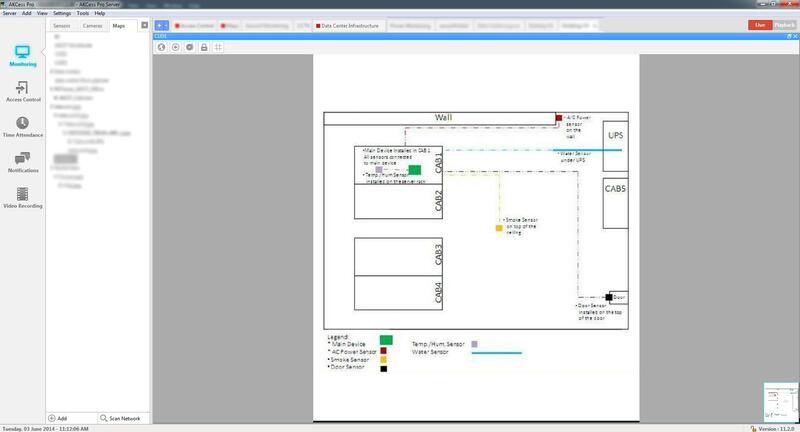 http://www.akcp.com/industry-news/the-canadian-university-of-dubai-power-and-sensor-monitoring/CUD’s server room operations team were able to overlay AKCP sensors on a map of each room. AKCess Pro Server mapping icons made it simple to represent different sensors in an intuitive fashion. CUD, like many of AKCP’s customers, used notification wizards on both the securityProbe and AKCess Pro Server to set up Email and SMS Alerts to receive advance notification of rising temperatures and also for doors that had been left opened for long periods of time, posing a security risk. In the future, CUD hope to install IP Cameras to complement their existing installation from AKCP. AKCess Pro Server supports a wide range of ONVIF IP Cameras that help in capturing video 24/7 or on sensor based events.